What Is the Best Way to Transition from Crib to Bed? For young children, making the switch from crib to bed is a monumental one. While some children take to a bed readily and happily, for others the experience can be traumatic. It's important that you handle the transition smoothly to avoid causing sleep issues in the future. Why are you switching your little one from crib to bed? Has he simply outgrown the crib? Is he attempting to climb out of it? Are you afraid of him injuring himself? Is there a ​new sibling on the way and you need the crib for the baby? Maybe you simply feel it is time. While there is no set age for moving a child from crib to bed, many parents choose to do so when the child is anywhere between 18 months and 3 1/2 years old. Hitting another big milestone -- ​being potty trained -- often leads to parents placing a child in a bed so they can climb in and out easily at night if they have to go. If you are making the switch because the birth of a new sibling is on the horizon, tread carefully. Try to get your older child into the new bed a good two months before the baby is due. You don't ever want your older child to feel as if he is being displaced by the newest addition to your family. What type of bed you choose depends entirely on what you are looking for. If you have a younger child who is on the smaller size, a toddler bed serves as a nice way to ease into the change. They are available in a variety of different styles that are sure to be appealing to your child. 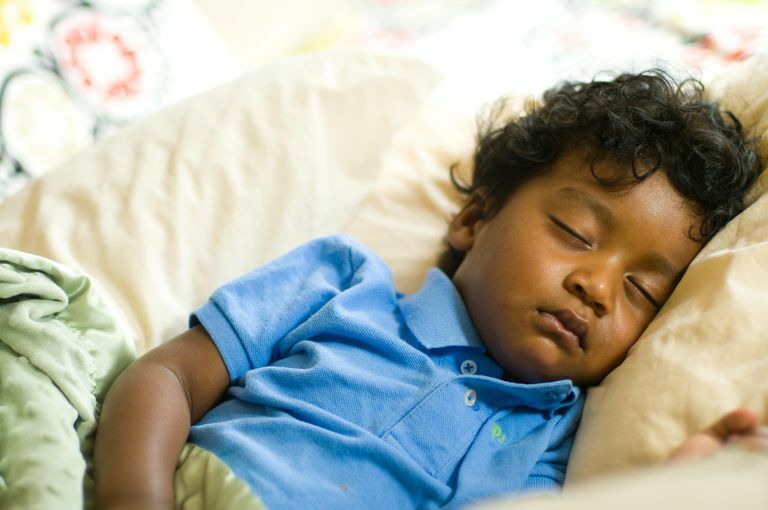 Plus, most toddler beds use crib mattresses, so your little one will be sleeping on a surface that he is accustomed to. On the other hand, if you have an older child, say 3 and up, you may want to go right to a twin bed or larger. No matter what type of bed you choose, ​secure the sides using guardrails. If it is possible, let your child be a part of the choosing process. He's more likely to be enthusiastic about the bed if he has a say in it. If the bed is a hand-me-down from someone else, you can use that to your advantage as well. Talk about how big the previous owner is and how now your child is a "big boy" too. Then take him out to buy sheets and blankets, maybe even some that star his favorite character. The Bed Is Here. Now What? Some parents find that first night with a bed is tough with a child that won't stay put. Others say their child hops right in, just like normal and nods off with no additional help needed. No matter what the case, be prepared. Adapting a bedtime routine if you don't already have one, can be a big help. If your child insists on getting out of the bed time and time again, calmly but firmly return him. If you aren't comfortable keeping your child's door closed at night, consider installing a gate in the doorway so you can still keep an eye on him. Let your child be part of the purchasing process -- the bed itself, as well as the sheets and blankets. If it's possible, place the new bed in the same spot the crib was. Let your child bring some of the elements of the crib into the bed -- a favorite blanket or pillow, perhaps, even if they are too small. Out of sight, out of mind is a good mantra to follow. If your child doesn't see the crib, he's unlikely to ask for it. So if you are using the crib for a new sibling, try to keep it hidden or covered until your child's transition to the bed is complete.